He draws comparisons to Mark Wahlberg, but lifts like Rob Riches. This teen doesn't sit around waiting for good things to come to him. He succeeds by failing in the name of getting bigger! I wasn't the leanest kid growing up. I was a pretty hefty little guy and managed to spend about 50 percent of my time playing "Halo." I eventually got tired of the fat kid look and started playing football. I played varsity football my freshman year as a middle linebacker at 5-foot-7 and 163 pounds. Turns out it's not the same as little league. I finished the year with a concussion that hit me so hard my leg got stuck in the air while I was out cold on the ground. Coming back three months later, I decided to try varsity rugby and wound up playing the equivalent position in rugby at 5-foot-8 and 175 pounds. The additional weight made all the difference. We made it to state that year and lost. I remember telling myself I wasn't going to feel like that again. I wanted to get so good that our team couldn't lose. The next rugby season at the first practice of the year I tore my ACL. With nothing else to do, I learned as much as I could about the weight room from a guy I consider my older brother, Gary Schneider. I still vividly remember lifting with barbells in bed two days after the surgery and then crutching around the weight room. I actually started in the weight room at age 12. I grew up with my brothers playing games with me like Spy X (essentially just a word they would yell right before they kicked me in the face). All in good fun; I always got them back. Another favorite game of theirs was Pick 'n Drop, where one brother would hold me in the air and the other would smack me in the stomach, and the minute I brought my hands up they would just drop me. Point being, I got tired of getting beat up on and decided I was going to return the favor when I was bigger than them. My dad always told me I had to wait until age 15 to start lifting, but he realized early on that it wasn't going to work. I used to sneak into the recreation center weight room at age 12 and pick up a curl bar. I had no experience lifting weights, so eventually I gained a little following of people who helped me out. In the end, it was the ability to get up and make myself better every day that sold it for me. 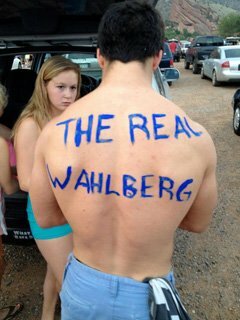 People tell me I look exactly like Mark Wahlberg, so naturally I looked up to him. I still remember seeing a Marky Mark poster and was convinced that was what I was going to look like. The plan is, and has been, to become the new and improved Marky Mark without the rapping. I also have to give a huge shout out to Complete Nutrition for sponsoring me. I wouldn't be anywhere close to where I am without them. The best workout plan is one that's always changing. I utilize techniques like FST-7, speed training, dropsets, supersets, trisets, high rep sets, isometric contractions, and more. The trick is finding what makes you feel the best and listening to your body. Some weeks I'll lift five days and others six or even seven. Starting out, I worked out every other day and it showed some results, but nothing like I was looking for. Dieting is incredibly important when it comes to making gains fast. You are what you eat. A diet plan is similar to a lifting plan in the sense that no one set diet works for everyone. Experiment with different diets until you find one for you. I love the fitness industry because it's packed with people who want to get better. I fear stagnation and sitting still isn't for me. The people I've met in the industry are all still having fun with it. I've grown up watching lots of people get desk jobs and get stuck places they dislike. The fitness lifestyle gives you an out when you're stressed. What (Or Who) Motivates You To Follow A Healthy Lifestyle? I'll always be a fan of Phil Heath, but it was always Mark Wahlberg who motivated me. Pretty sure he was my dad. I've also looked up to Rob Riches the whole time I lifted. The single biggest motivator I ever had was Gary Schneider; a good friend and someone I consider family. When I tore my ACL, he taught me everything I know about the gym. Beating my brothers up and hopefully playing on the national rugby team someday is my motivation. Gary Schneider continually plays a huge role and pushes me to get better. I want to continue training to get bigger. I have a similar build and measurements to Rob Riches and he's always been the one I looked up to. One day I want to be good enough to train and compete with him. I also plan to create a high school fitness program and a website. If you have more in you, give more. The biggest problem people have in the gym is failing to fail. Push yourself; it's the last couple reps that count. Find a training partner. Learn everything you possibly can. Be open to new training ideas, but most importantly, don't let bodybuilding be the only aspect of your life. Bodybuilding should feed your ego in a way that causes you to meet more people, not less. Rob Riches, Phil Heath, Roger Snipes, Jamie Eason, and Miss Prestin. I order supplements from Bodybuilding.com quite a bit and use their videos and articles as motivation.